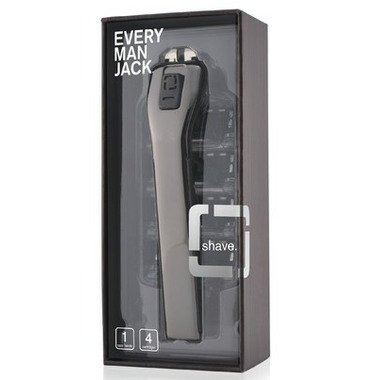 The Every Man Jack Razor Kit comes with your new razor, display stand, and four cartridges to get you started. Each cartridge is mounted with six long-lasting, easy-to-rinse blades. The open flow design allows hair follicles and shaving cream to pass through cleanly, eliminating corrosion and extending blade life. A lubricating strip with Olive Oil, Chamomile & Herbal Extract moisturizes, soothes, and protects even the most sensitive skin. The razor is handcrafted and gives you maximum control and maneuverability, built for your closest shave ever. So you look and feel your best. This is NOT a good razer. It is not ergonomical at all. Very awkward to hold in the hand. The blades do NOT shave very well and in less than a week the blades were starting to cut my face. Very disappointed. As a female - I love this razor ! Love what this company stands for. Fairly sure my husband is jealous of my new razor. HIGHLY recommended!! !